Ground floor apartment for sale in Moraira.Located in a very popular urbanisation with two communal swimming pools, this well presented apartment has been renovated.This one level property is accessed on the same level as the parking. There is a terrace with a small garden, overlooking a wooded area. The living room opens onto the terrace, there is a dining room with open kitchen with access to a rear terrace, an inner hallway leads to two double bedrooms and a bathroom with shower.Other extras include: Two communal swimming pools with outdoor shower, parking space, electric central heating, satellite TV and telephone line. La Cala is a prestigious urbanization ideally located in a popular area of Moraira. Named after the Spanish Word for Cove, due to its idyllic location surrounded by sea with various secluded award winning beaches close by, this exclusive urbanization offers everything you could want for your perfect home with shops, bars and restaurants all within walking distance and a short drive to the centre of town including a local service. 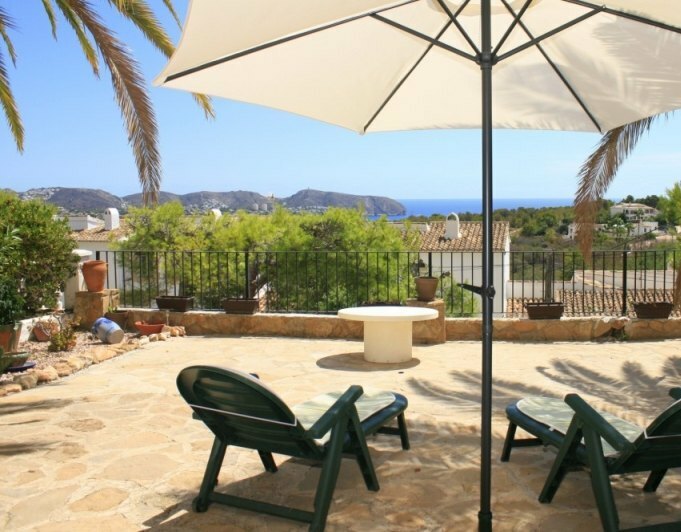 Lovely and very stylish townhouse for sale in Moraira. Set on an exclusive residential area and featuring amazing views, this townhouse is comprised of two floors with a large sun terrace. The main living area is entered from the same level as the off road parking. Here is the living room and kitchen plus a bathroom.. On the lower level are the two bedrooms and a bathroom. There is lots of terrace space. Comes with airconditioning and large log burner. There is also plenty of space to add another bedroom if wished. 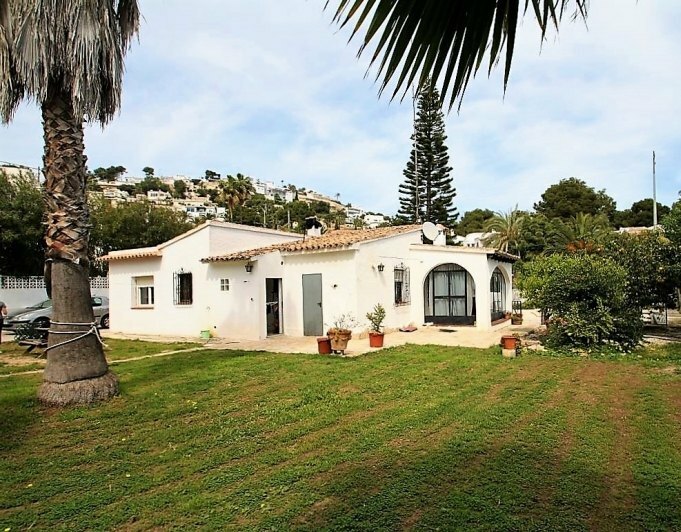 REDUCED TO SELL!Detached bungalow for sale close to El Portet, Moraira. This well presented bungalow is located within walking distance to the beautiful village of Moraira and El Portet.The accommodation comprises of 2 double bedrooms, both with fitted wardrobes, a familysize bathroom, fully fitted kitchen, large lounge/diner overlooking the communal swimming pool and with stunning mountain views towards Fishermans Cove.There is an under build, currently being used as a storeroom, which could be converted to a two bedroom apartment. Bungalow for sale in Moraira, Sea views. Sea view bungalow for sale in Moraira. This immaculately presented villa is located in the popular Urbanisation, close to the San Jaime and Golf Ifach.This property benefits from private off street parking and the accommodation on the main level comprises of entrance hallway, with solid wood doors leading to a bathroom, two double bedrooms, an independent kitchen with sliding door and a spacious lounge with large picture window offering fabulous sea views, the adjacent door opens onto an open private terrace also with sea views.External stairs lead down to the side of the property and a private garden, with sea views, a covered porch with a door leading to the guest accommodation, which comprises of a lounge/diningroom, a double bedroom with and ensuite shower room and a single bedroom.Extras include: Grilles on the windows and mosquito nets, ceiling fans in the bedrooms upstairs, covered and uncovered terracing, off street parking and a fabulous communal swimming pool. Villa for sale in Moraira, all on one level. Detached villa on a totally flat plot of 870m2 approximately 20 minutes walk from Moraira town center.Accomodation is set all on one level and it comprises 2 double bedrooms, 1 single bedroom, 1 family bathroom, separate fully equipped kitchen and lounge/dining area, outdoors there is a freeform shape private pool with integral table and seating area. There is enough room to extend the existing property.The property boasts large outdoor space with plenty of off road parking, quite neighbourhood, wood burning stove, private pool and is close to town. 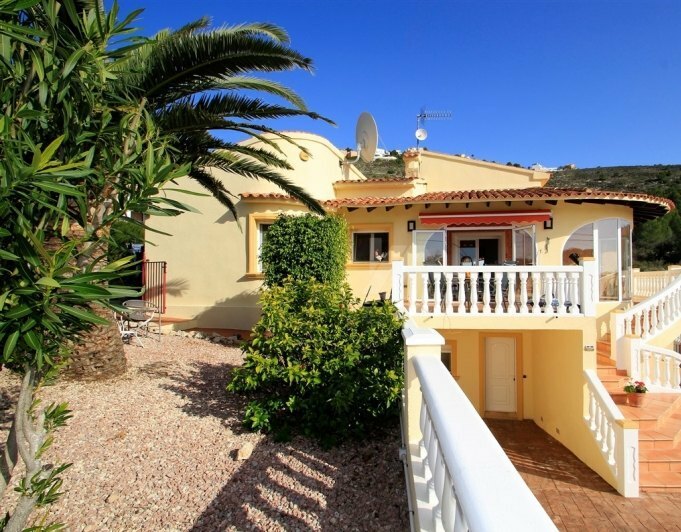 Bungalow for sale in El PortetImmaculate detached property for sale in Moraira in a community of only 12 houses, very private and offering lovely open views . Located in a very sought after area just a 5 minute drive to the beach of El Portet and to the town centre of Moraira.The villa is divided into three levels. The main level of the house is entered via the lovely private garden, and on this level are two double bedrooms and family bathroom, a lounge/dining area with feature fireplace housing a electric fire, ther is an independent, fully equipped kitchen, all these have lovely views towards the mountain. An external staircase leads you to a third double bedroom with ensuite bathroom, French doors open to a private balcony which also offers lovely views.Steps go down to the gardens where there is the separate guest apartment with a small kitchen, dining area, a double bedroom with builtin wardrobes, a bathroom and access to the terrace via glass doors. The apartment is ideal for guests and family visiting, or even for rental.From here a flight of steps leadsup to the lovely communal terrace with swimming pool and poolside showerExtras include: H&C air conditioning, Gas Central Heating, double glazed windows with mosquito nets, SAT TV/ADSL/Telephone line, Carport for 2 cars, BBQ area, .. This very attractive and comfortable villa with large pool and garage is only 700 m from the centre of Moraira. On a flat plot of 800 m2, south orientation with sun all day and fully enclosed. Views are very nice, open and peaceful, vines, pine woods, the top of the Peñon and on the distance the beautiful Bernia. The single storey villa is 120 m2+ built and renovated with high quality materials. Entrance is via an attractive porch with then on through a dining area with a high beamed ceiling, there is a separate fully equipped kitchen with upper units and pantry. The 23 m2 lounge has a fire place with a wood burner and built in shelves on both sides. The villa has three bedrooms a family shower room, vanity unit, WC and bidet. The master bedroom has a shower room en suite, with a double sink unit, WC and bidet. To the exterior of the property there is a garage with 2 built in cupboards, long driveway for several cars and covered carport for 2 cars, also the gas bottle storage. There is a 10 x 4 private swimming pool, large terrace, shower and barbecue with sink. The mature garden has an automatic watering system and also a large 8 x 4 pergola ideal for those meals with friends. The garden is easily maintained with palm trees and aromatic plants, also a second barbecue. There is a further terrace with a double pedestrian gate and automatic gate for the vehicles. The property is central heated and there are ceiling fans in the bedrooms and lounge, there is also a connected alarm, programmed lights and sensors, window moldings, grilles, top quality PVC double glazed windows and patio doors with security glass, water de-calcification, satellite, ADSL and a practical paved basement for extra storage, wine cellar etc. There are 2 supermarkets only some 200 m away, bars and restaurants and some shops. 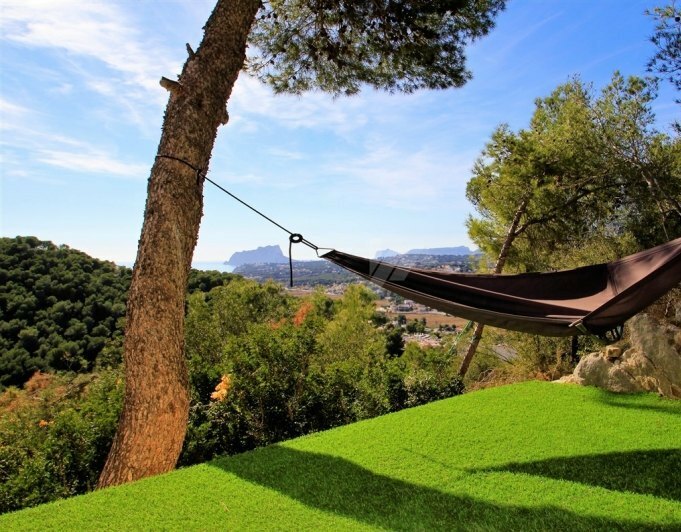 Property for Sale in Moraira, mountain views. Villa for sale in Villotel, Moraira with lovely valley views.Entering the property with a few steps from the parking there is a lounge/ dining room, a glazed naya and a fully equipped kitchen. Following the hallway there is are two large double bedrooms which share an independent shower room.Below the main accommodation there is a guest apartment of 41m2 which consists of a private and independent terrace, lounge/dining room, open kitchen, a shower room, a double bedroom and a single bedroom.Outside there is a terrace, with open views, which benefits of an 8 x 4m swimming pool, a poolside shower, a small terrace with a pergola and a mature, easy to maintain garden with various Mediterranean plants.The property also has a parking space and an entrance to the villa from the street below.Extras include: H&C Airconditioning, Fireplace, Alu. Windows, Double Glazing, Covered Terrace, Sat TV/ ADSL/ Telephone, Alarm, Driveway, Storage/Utility Room, Poolside Shower. Three bed bargain modern villa for sale in Moraira. 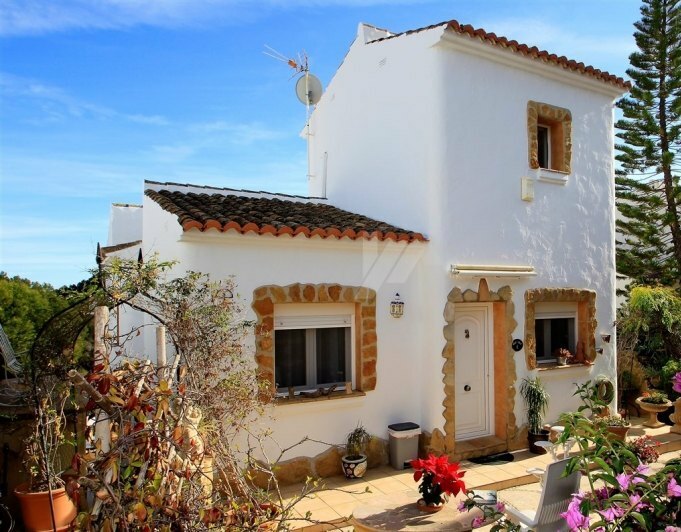 This villa has been recently renovated to high standard and is built over two levels. It consists of three double bedrooms and three bathrooms, a large open plan kitchen joint to the living room with direct access to the outside covered terrace. This property features double glazed windows, central heating and fitted wardrobes. Charming villa for sale in Moraira in a quiet urbanisation at just a short drive to Moraira.The 980m2 plot of this lovely villa is accessed by an automatic gate/pedestrian entrance giving ample parking space. A few steps up lead to the main level of the propery. Entering via the glass doors leading you to the enclosed naya, from here you enter the spacious living room area with featured log burner leading you to the hallway. On the left hand side is the separated fully equipped kitchen. Following the hallway are two double bedrooms sharing a family bathroom. The separate apartment can be accessed either via the internal staircase, or via the separate entrance at the driveway, with lounge/dining, kitchenette area and two double bedrooms, and a bathroom a shower.Outside is a lovely private pool area with a rectangular 10x5m pool and outside shower. There is a separate annex currently used as an entertainment room with outside toilet, which can be converted into a summer kitchen with bathroom or an extra guest house. All water and electric connections are pre installed.Extras:open/covered terrace, parking space. Sat TV, Internet and Telephone connection, Storage room, etc,..